First of all, please click on the artwork by Tom Kyster to enlarge it and see the billions of details and tons of hours he put into his latest submission to a Game-Art-HQ.com Art Project. My God..just imagine to be the poor soul who has to battle or better run away from this thing and its flying two sword wielding friend. 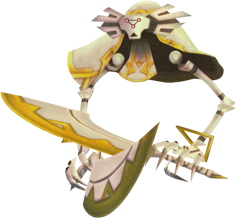 The Guardians are very powerful enemies in the Silent Realm from The Legend of Zelda: Skyward Sword. They chase Link who has to evade them and their attacks, otherwise he is defeated after the first hit already. 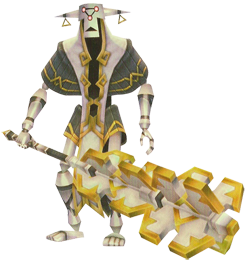 The big guardian is relative slow and obstacles can block his path, but the flying guardians can be a real pain.